Eubulus and Nymphas together being associated with Christ. 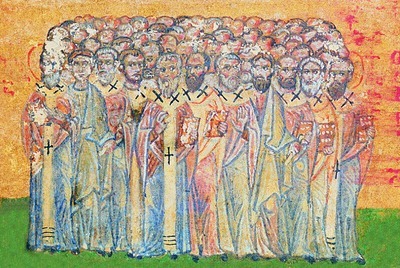 The Holy Apostles Nymphas and Eubulus were disciples of the Apostle Paul. Nymphas is mentioned by Paul in his epistle to the Colossians (4:15): "Greet Nymphas and the church that meets in his house." He was a Christian resident in Laodicea, to whom Paul sends salutations in the epistle which he wrote from Rome to the Church in Colosse, the latter city being only a very few miles distant from Laodicea. Indeed, so near were they, that Paul directs that the Epistle to the Colossians be read also in Laodicea. Nymphas was a person of outstanding worth and importance in the Church of Laodicea, for he had granted the use of his dwelling-house for the ordinary weekly meetings of the Church. The Apostle's salutation is a 3-fold one to the brethren that are in Laodicea, that is to the whole of the Christian community in that city, and to Nymphas, and to the church in his house. This fact, that the church met there, also shows that Nymphas was a person of some means, for a very small house could not have accommodated the Christian men and women who gathered together on the first day of every week for the purposes of Christian worship. This fact proves him to be a person both of Christian character and of generous feeling. Eubulus is mentioned in the Second Epistle to Timothy (4:21): "Eubulus greets you." He was one of the members of the Church in Rome at the time of Paul's second imprisonment in that city. The Apostle mentions how, at his first answer to the charges brought against him at the emperor's tribunal, the Roman Christians as a whole proved disloyal to him "no one took my part, but all forsook me" (2 Timothy 4:16). In these circumstances when the desertion of Paul by the Christians in Rome was so disheartening, it is pleasing to find that there were some among them who were true, and Eubulus was one of these. Paul therefore in writing the last of all his epistles sends to Timothy a greeting from Eubulus. Nothing more is known in regard to Eubulus. As his name is Greek, which means "prudent" or "good counselor", he was probably a Gentile by birth.